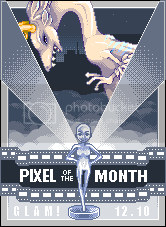 Pixel of the Month December '10! - GLAM! This month's winner is jessig! That's not a very traditional dragon, where did the idea for him come from? I thought about doing a dinosaur at first. But as I worked I knew I couldn't keep it that simple. So I changed my concept to something more fantastical. I wanted to give him wings but not true-flight ones. Because my original concept was dinosaurs, I was seeing him more as a raptor. Granted, those chunky legs wouldn't propel you all that fast, but he's a land creature with proto-feathers. Is he shaded in your normal style or did you try something new? I tried to stick with my usual style. However, my usual style applies to clothing. Being that this is an animal with musculature, I couldn't keep it the same way in the end. It's highly experimental, but I'm proud that I tried something new. How do you pick colors? Did you pick the colors first or did you change them later? Honestly, I arbitrarily selected the purple color for the outline. The tan was supposed to be a holding place for a different purple. But I liked the tan so much that I kept it. Was there any part of him that was surprisingly easy? The legs were easier than I imagined, but I wouldn't say his design was easy. I was very concerned about shading the thigh area, but it just sort of worked itself out. The tail. It looks like he broke it at the back because of my shading.